Dimitry B. By: Dimitry B.
Jingshan Park is a public park covering around a fourth of a square kilometer (about 57 acres) immediately north of the Forbidden City in Beijing, China. 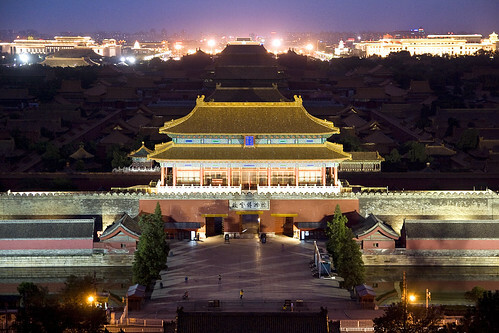 The focal point is the artificial hill Jingshan, literally "Prospect Hill". Formerly a private imperial garden attached to the grounds of the Forbidden City, the grounds were opened to the public in 1928. The park was formally established in 1949. It is listed as a Key State Park and is administratively part of both Xicheng and the Dongcheng districts in downtown Beijing. Jingshan's history dates to the Liao and Jin Dynasties, almost a thousand years ago. The 45.7-meter (150 ft) high artificial hill was constructed in the Yongle era of the Ming Dynasty entirely from the soil excavated in forming the moats of the Imperial Palace and nearby canals. It is especially impressive when one considers that all of this material was moved only by manual labor and animal power. Jingshan consists of five individual peaks, and on the top of each peak there lies an elaborate pavilion. These pavilions were used by officials for gathering and leisure purposes. These five peaks also draws the approximate historical axis of central Beijing.